"These results summarize one year full with intensity, abnegation, sacrifices and investments. We are happy to have achieved all our goals and to be able to offer these three titles to our fans and sponsors who supported us all the year. I would thank before all the Tonton staff which follows us on all the tournaments and which enables us to approach the tournaments in all serenity. Then I would thank my players for who this long and tiring season. They manage to keep the intensity of play and our ultimate objective to win the LNP and the Millennium. Then I would to thank our leaders who for more than 20 years are present and passionate always as much as we are. This victory is not only ours, it also belongs to Dye, SupAirBall, Safer, Energy Paintball, Projet K, Virtue, Xpaint and all our supporters. "The London Tigers would like to thank all our sponsors, GISPORTZ, Planet Eclipse, Manic and Lips for all their support, our training ground, Bricketwood for their continued use of their great facilities. Also we would like to thank the support of all the other UK teams who helped us to have our second win in Chantilly. And I would like to personally thank all the guys on our SPL squad, and all the other London Tigers teams for making me proud to say I am the owner of the London Tigers. And last but not least to my good friend and long time team mate Twizz, with out his unstoppable will to win we wouldn't of had this great season." "After fine-tuning our new tactics during the previous Millennium Series Ltd rounds, Art Chaos had to win Paris, Chantilly, now that's done - and it is the result of intense tactical brainstorming and a lot of hard physical training. We are happy to offer this victory to our increasing fan-base whose support is of paramount importance to us. We have enjoyed the new location - as well as the spotless organization of the tournament. All our thanks to Millennium's Paula who's lent us all her kind help all throughout the season, as she usually does since the first day we entered this circuit." 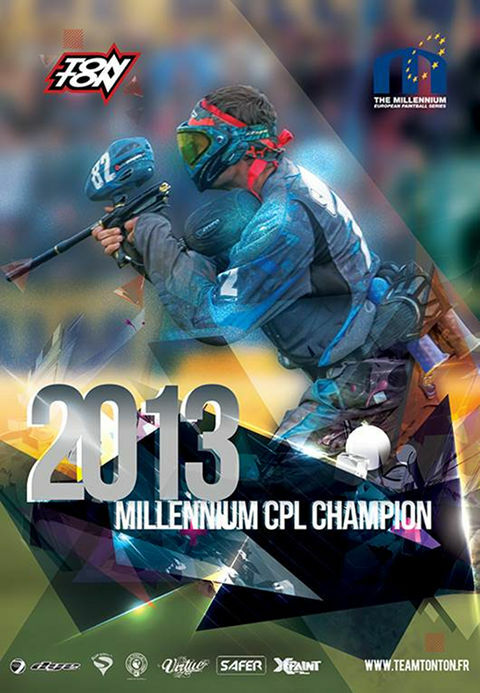 The 2013 Millennium Series rankings for the Champions Paintball League, the SPL, Division 1, Division 2 and Division 3 are online. On behalf of our sponsors, we take this opportunity to remind all teams and players that all Paint used at Millennium Events must be purchased on site, from our paint sponsors. You cannot bring pre-purchased paint onto site, this also applies to Thursday training sessions. There will be penalties for any teams, or persons not complying with this rule.